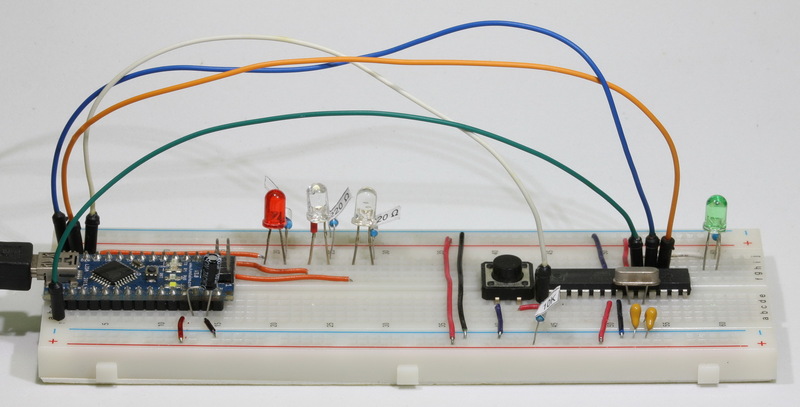 In a previous post I showed how to make your own Arduino on a breadboard. The next step is programming it. 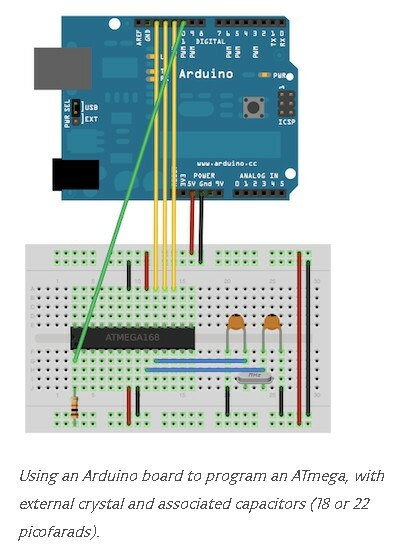 If you google “using Arduino as a programmer” you will find most of the results are for using an UNO, very few are for the Nano. One Nano guide I did find is at Lets Make Robots This explains how to set up the Nano but it does not clearly show how to program a stand alone Atmega chip. I assumed the Nano was the same as the Duemilanove and used the “Using an Arduino as an AVR ISP (In-System Programmer)” guide on the Arduino site. Unfortunately I couldn’t get it to work. After much google research I found that I needed to keep the reset pin on the Arduino Nano high by using a capacitor between the ground and the reset pin. I later found this is specific to certain Arduinos only. First we need to turn the Arduino Nano in to a programmer. This is done by uploading the ArduinoISP sketch. 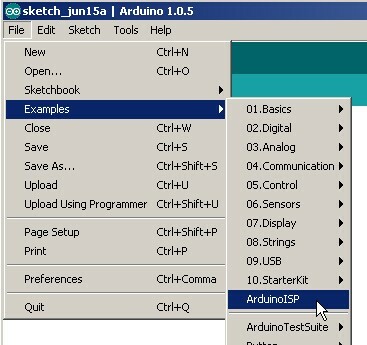 The ArduinoISP sketch is part of the Arduino software package and can be found in the examples folder. Connect the Nano to the computer by USB as usual and load the AuduinoISP sketch in to the IDE. If you have already added a capacitor to RST & GND you need to remove it. and change the delay(40) to delay(20). Then compile and upload the sketch. If you look at the sketch, you will see that it recommends adding status LEDs. The LEDs are optional but I prefer to have them so I can see what is happening. I use a red LED for the heart beat and two white LEDs for error and programming. Remove the power (USB lead) and add the resistors (220 or 330 ohm are good) and LEDS. Reconnect the power and if everything is working you should see the LEDs quickly flicker and then the LED on pin 9 should pulse on/off. 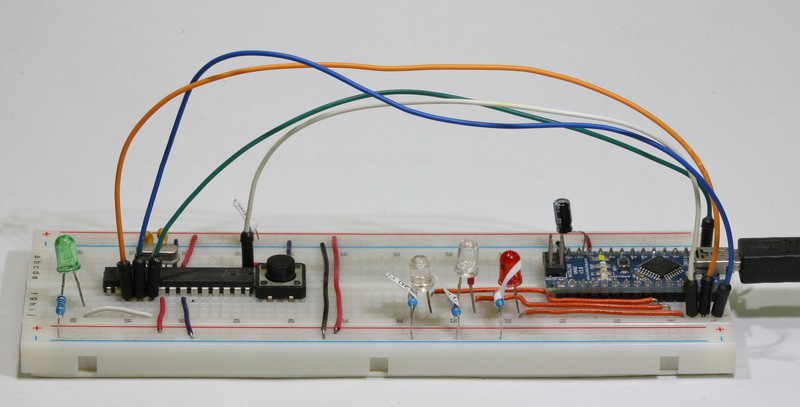 The Arduino renames the pins to make things easy for the user. The ATmega pins are shown below. 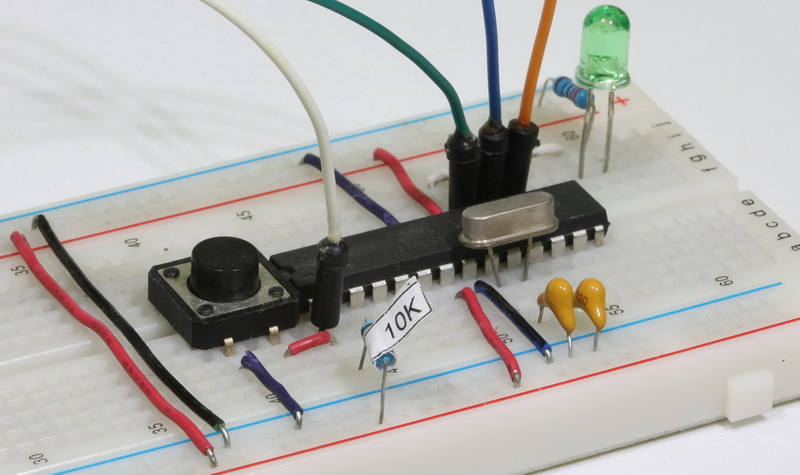 New ATmega chips are set to use the internal clock at 1MHz. We need to program the fuses so that the external 16MHz crystal is used. The easiest way to do this is to load a boot loader. This will set the fuses and we can over write the boot loader later. 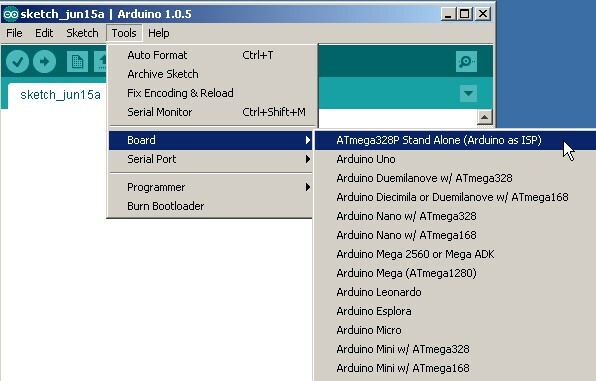 When programming the ATmega chip you can select a suitable similar board in the Arduino board list but this will assume a boot loader is present and reduce the amount of program space available. We can create our own board definition that tells the Arduino IDE to use all available memory and use appropriate fuse settings. The different Arduino definitions are stored in a file called boards.txt. 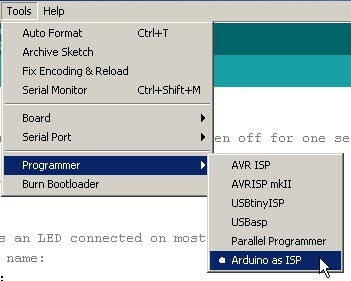 On Windows systems the boards.txt file is in the folder “\hardware\arduino” inside your Arduino installation folder. I normally search for it. Rename the file to boards.BAK. Open the boards.BAK file in a text editor, Notepad can be used, and save it in the same folder (“\hardware\arduino”) as boards.txt. The boards.txt file contains options for various different Arduinos. 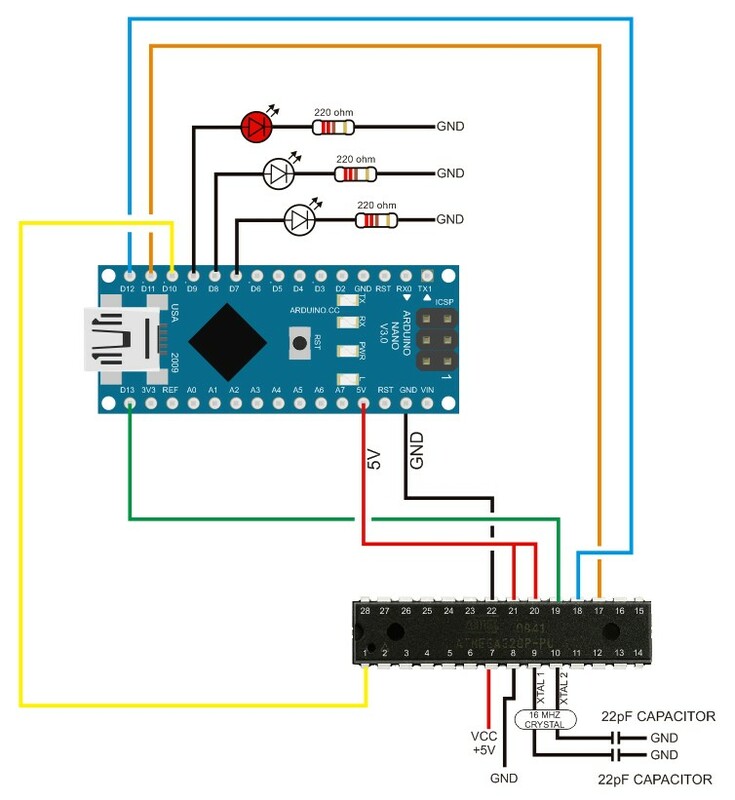 These are arranged in groups and each Arduino model is separated by lines of #s.
We want to create out own entry for the bread board Arduino and it is easiest to use one of the existing entries. Copy the uno entry and paste at the top of the file. Now edit the section you have just pasted. Change the uno at the start of each line to something else. I used “atmegasa16, short for “atmega stand alone at 16Mhz”. Give it a new name (atmegasa16.name=)- I used “ATmega Stand Alone (Arduino as ISP)”. Since I am not using a boot loader I can use all of the program memory so I changed atmegasa16.upload.maximum_size to 32768. 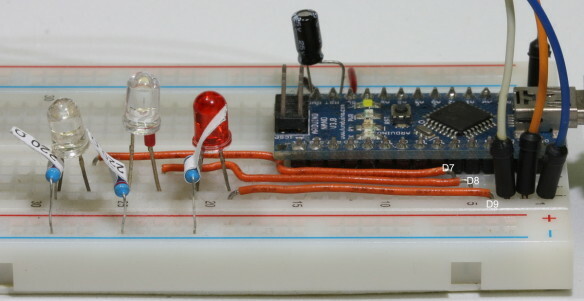 I am using the ArduinoISP so I changed atmegasa16.upload.using to arduino:arduinoisp. Change atmegasa16.bootloader.extended_fuses=0x07 to atmegasa16.bootloader.extended_fuses=0x05. 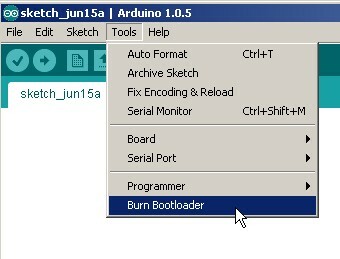 This is the standard Arduino setting. (I will cover the basics of fuse settings in another post). We should now be ready to program the ATmega chip. Connect the Arduino Nano to the computer. To make the ATmega chip use the external crystal we need to set certain fuses. An easy way to do this is burn a boot loader. When we upload a sketch later, the program memory is over written but the fuse settings are not. Select the Board you have just created. If everything is OK then the programming LED on the Nano ISP should light (pin 10) and the LED on pin19 of the ATmega328P should flicker as the boot loader is uploaded. Make sure the board to be programmed is the Atmega stand alone and the programmer is set to Arduino as ISP. 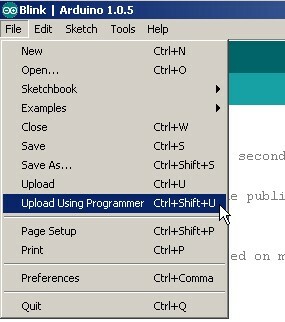 In the main menu select Upload Using Programmer (or press Ctrl+Shift+U) and the Blink sketch should upload. Note that you need to use the menu option not the upload icon. resp=0x15 is very common when the Arduino ISP is resetting. A simple solution is to add a 10uF capacitor between reset and ground on the Arduino Nano (not the Atmega chip). This keeps the reset pin high and stops the Nano resetting. Another solution is to add a 120ohm resistor between reset and +5V but I couldn’t get this to work. I have used a couple of different Nano’s as programmers, an original that doesn’t require the capacitor, and a clone (cheap China version) that does. It means the ATmega is not resetting. 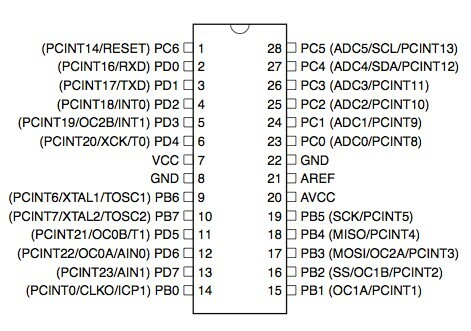 Check the connection between Arduino pin10 and the ATmega pin 1. This entry was posted in Arduino, ATmega and tagged Arduino Nano, ArduinoISP by Martyn. Bookmark the permalink. Hi, I like your tutorial! I want to use my nano to program a atmega16 chip. I need to load a .hex file to the chip. Is it possible to do it following this tutorial? I am just a newbie to programming btw. However, I didn´t find any tutorial on youtube, so I hope you can help me. Thank you for your heard work.I try to edit board.text file,But window deny to save it.How can I save that file ? Can I program At mega 328p_pu with any other boad menu ? u have a great tutorial. unfortunately i am having a problem while uploading the bootloader. I have cross checked the whole circuit many times but the following error is appearing again and again. Please help me. It sounds like you have the non P version of the chip Atmega328-PU (1E 95 14 vs Atmega328P-PU (1E 95 0F) and you may need to edit the avrdude.conf file. -F is used on the command line and allows you to ignore the the ID mismatch. For anybody else coming to this. I have just had issues with the AudionIISP reporting incorrect device signature. 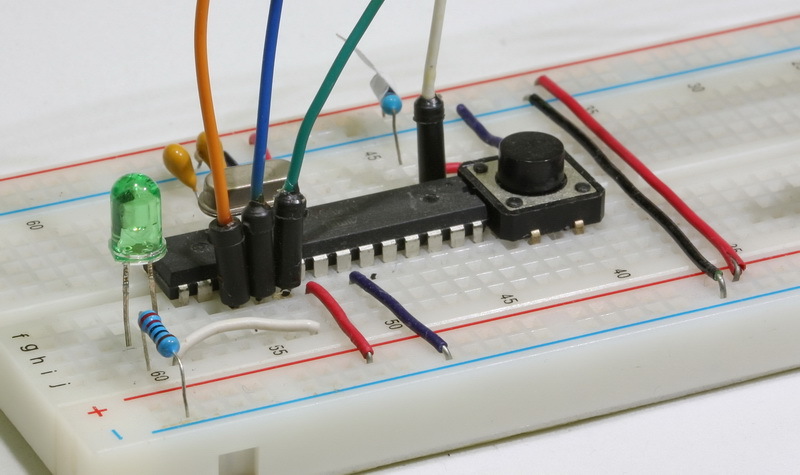 I have already programmed the chip and knew it was OK. After a lot of messing around I discovered it was a bad connection due to a faulty breadboard. Really great tutorial. hooked wires and the chip to the breadboard with Nano and it worked right away without any status LEDs !! I have setup arduino nano as isp programmer with standalone Atmega328p-pu. I have success with programming. You need a serial to usb adaptor of some kind. The Arduino has this built in and for stand-alone avrs I find the easiest option is to use an adaptor. Have a look at http://www.martyncurrey.com/arduino-esp8266/. This is not for the Atmega (its for the ESP8266) but is shows how to use one of the adaptors. Dear Martin,thanks for the wonderful detailed explanation,I am a newbie for Arduino.Can we upload the Sketches for the bootloaded AT328P in the same way. Do you mean your AT328P already has the bootloader installed? If so, yes you can upload this way but the bootloader will be over-written/erased when uploading a new sketch. If using this method to upload sketches you do not need a bootloader. The bootloader is used to enable communication via serial/usb and since this method does not use usb the bootloader is not required. great, great work and explanation, thank you! I have build it and works perfectly (with the 10uF capacitor). I added a socket for a 3 pin ceramic resonator to test the ATMega328P chip with various frequency (16 and 20 Mhz). Thank you sir. Your tutorial helped me a lot! I successfully uploaded new sketch to my smd standalone arduino chip after weeks of trying. Hooo! Can Arduino Nano clones be used as a programmer? yes, in the example above I uses a clone. Hi! thanks for sharing this great tutorilal!,Im a beginner with microcontrollers. This will work to program a 380p working with 20.000 cristal clock? I don’t see why not but I haven’t actually tried. Give it a go and let me know if it works. My IDE version is 1.8.1. – the chip is expecting an external clock and one is not connected or not corrected properly. Hello sir i am using atmega 328 -pu . when i am trying to burn Bootloader its showing this message : avrdude: Yikes! Invalid device signature. 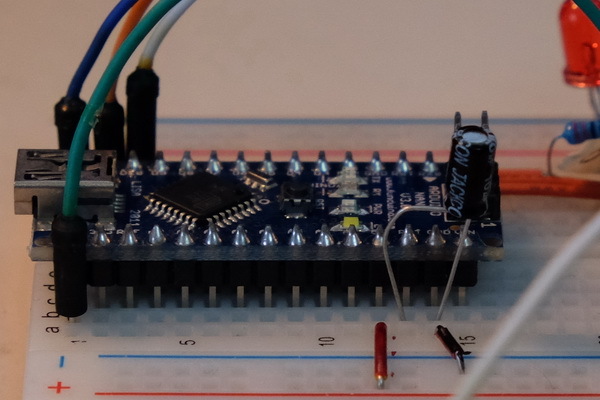 thanks for very good tutorial, but is it possible to burn a bootloader onto a 328p while other pins are connected to external circuitry, eg. SDA SCL pins are connected to some sensor, etc. It should be OK since the SDA (27) and SCL (28) are not used for programming. You are likely to run in to issues if the sensor uses the SCK, MISO and MOSI pins though. I have a different problem: I success to load bootloader thru. ISP, but after that, I can not successfully communicate with the ATMEGA328P thru the serial port (tx/rx…). I check the serial cable and its look ok. I set the fuses as: Low=ff, High=de, Efuse=ff. Do you have any idea of the problem? Does the fuse set ok? I don’t fully understand the issue. Are you trying to connect via usb/serial, like a regular Arduino? How do you overwrite the bootloader after it has been burnt and run? The boot loader is automatically over-ridden when you use a programmer rather than usb to program the Arduino or an ATMega chip. can you please guide me how can i use Nano board to load Atmega8A with 4Mhz crystal. I don’t have a guide but it is very similar to the 168 and 328. See https://www.youtube.com/watch?v=fmSNy6NAsYs for a video guide. Yes it will. I don’t have any information on doing it though. There is lots of information online and the Nano can be used the same as any other (similar) Arduino. I would like to add my TL866CS programmer to the list. How do I know what settings need to be made for any particular programmer? Looked for a universal solution for programming sketches AND boot-loader to set the fuses. One concern: as D13 of the Arduino is connected to D19 of the ATmega chip, can you blow up the either of them as they have different output values? I successfully uploaded new sketch to my Arduino nano chip after add capacitor 10uf between reset and ground. Thanks for your heard work.I try to edit board.txt file ,But window deny to save it.What can I do to save that file ? Can we use any other boad to do that ? Ive been using a capacitor between the atmegas reset and ground wondering why it wasnt working. Thank you for specifying to use the nano’s reset, which fixed my issue. I am looking for a arduino pro to program a prototype for a patent I am the author of . It’s a project that can saves lives, so quite a mission to be part of ! If you or someone in your network is interested I would love to hear from you.